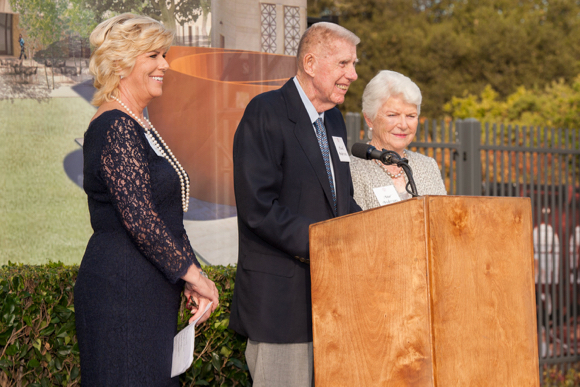 Philanthropist and art collector Harry W. “Hunk” Anderson died on Feb. 7 at his Atherton home surrounded by his family. He was 95. Anderson was the founder of food services company, Saga Corporation, and with his wife, Mary Margaret “Moo,” and daughter, Mary Patricia “Putter,” a devoted art collector. In 2011, Stanford University announced that it would become home to the core of the Anderson Collection, one of the most outstanding private collections of 20th-century American art in the world. The collection of 121 works by 86 artists housed in an award-winning building designed by Ennead Architects in Stanford’s arts district opened to the public in 2014. In 1975 the Andersons started a graduate internship program for Stanford doctoral art history students that continues today. More than 30 doctoral candidates at Stanford interned at the Anderson Collection, engaging in intensive study and organizing exhibitions drawn from the collection. The family’s first gift of art to Stanford was made with other donors in 1993 when they funded the completion of Stanford Wall (1980) by Josef Albers, currently installed near Littlefield Center. Albers donated the design for the sculpture in 1973, but the sculpture was not fully realized and installed until after his death. Harry W. Anderson was born in Corning, New York. His father and mother immigrated to the United States from Sweden and Norway, respectively. 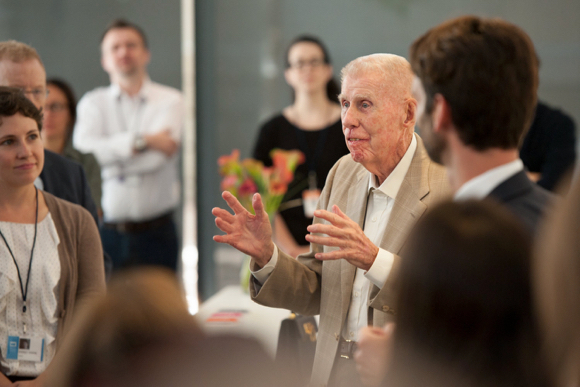 After serving in the U.S. Army during World War II, he attended Hobart College in Geneva, New York, where, during his junior year, he co-founded the food service company Saga to manage the college’s cafeteria. After he and Moo married in 1950, they moved around the country to establish Saga at other colleges. In 1962, three years after the birth of their daughter, Mary Patricia “Putter,” they moved to the Bay Area and opened the national headquarters for Saga in Menlo Park. The Andersons began collecting art in the mid-1960s after a trip to the Louvre in Paris, where they admired works of the French Impressionists. They initially collected work by Early Modernists, such as Pablo Picasso and Henri Matisse, the German Expressionists, such as Emile Nolde, and the Early American Modernists, such as Georgia O’Keeffe, Marsden Hartley and Arthur Dove. By 1969, however, the Andersons made the decision to concentrate exclusively on postwar American art. A large part of the Andersons’ collecting philosophy rests upon their equal beliefs in the head and the hands – meaning that they look for ingenuity as well as masterful craftsmanship in the art they collect. The core of their collection that is now the Anderson Collection at Stanford University ranges from works by Willem de Kooning to Joan Mitchell, Jackson Pollock to Wayne Thiebaud. The collection is anchored in the work of the New York School and incorporates key modern and contemporary artists, collected in depth and across media. The Andersons considered themselves custodians and not owners of the art in their collection, and the generous gift to Stanford was made with the purpose of sharing their important and expansive collection with the world. For all the enjoyment Hunk and Moo Anderson took in building an art collection, they seemed equally pleased to give it away. Upon taking the lectern at the groundbreaking ceremony for the building (photo above) that would become the home for his family’s most prized possessions, a visibly delighted Anderson, standing between Moo and Putter, triumphantly declared to the university community, “First down, Stanford!” He went on to share his hope that the new museum would be a stopping place for people to enjoy the ideas of visual expression. For many years the Andersons have shared their collection widely through loans to museums and special exhibitions, including Celebrating Modern Art at the San Francisco Museum of Modern Art (2000-2001) and An American Focus at the Fine Arts Museums of San Francisco (2000). The Andersons gave significant portions of their collection to these museums, including their extensive Pop Art and Frank Stella collections to the San Francisco Museum of Modern Art. The Fine Arts Museums of San Francisco received 655 graphic works that established a collection sharing program, which strives to assist small museums in expanding their exhibition capabilities through individual loan offers and high-quality exhibitions of Anderson Collection works. Anderson is survived by his wife, Mary Margaret “Moo” Anderson; daughter, Mary Patricia “Putter” Anderson Pence, an art advisor in Los Angeles; and granddaughter Devin Pence, a first-year student at Stanford Graduate School of Business. The family plans to have a private burial but looks forward to hosting a celebration of Hunk’s life in the spring. In lieu of flowers, the family requests online donations to the Anderson Collection at Stanford. Checks can also be made out to the Anderson Collection at Stanford University; mail to: Aimee Shapiro, Anderson Collection at Stanford University, 314 Lomita Drive, Stanford, CA 94305.